Here's an entertaining recipe that you and your guest would surely love. I got their recipe from cooking club to which I am a member. You might wanna try making this one day. The next time you need an elegant and impressive dinner party dish, try planking. In this technique, salmon is cooked on a cedar board, imbuing it with rich, smoky flavor. 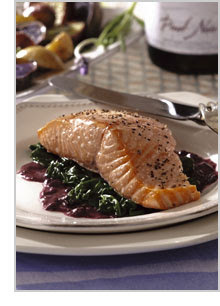 Here the fish is paired with a velvety Pinot Noir-based sauce, which you can make the day before. Be sure to start soaking the planks the night before, too. wow...looks good! i might try that after the holidays...sinasamantala ko nang kumain ng mga nakakataba during the holidays since after new year, magda-diet na ako (lol!) wish me luck! Hi Thanks for the link. Well nice food you have over there. hello mommy, that sure looks yummy..
btw added this one in my medical updates blog..thanks for the visits..
hahaha, okay lang yan mads... dhemz love salmon.. i lobe bolinao too lol.. Thank you so muc ate cecille..
thanks a lot dhemz, loveya!